American Cruise Lines was part of the original boom in small, American-flagged coastal cruising that started in the late 1970's and early 1980's. 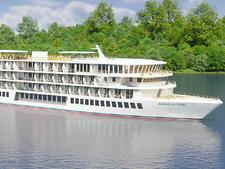 Today, the company has grown to become the largest cruise line in the country, offering both small ship river and coastal cruising throughout the U.S., with over 35 itineraries to 25 states. American operates the largest fleet of new small ships in the U.S. All of the line’s ships are under 200 passengers, and are designed and built in the U.S.A.—they are also U.S.-crewed and flagged. American’s fleet includes: small fully stabilized coastal cruise ships, Victorian-style paddlewheelers and the only modern-style riverboats available in the U.S.
American’s fleet sails along the rivers, protected coastlines and inland waterways of the U.S., making them a popular choice for those who prefer river cruising and especially for those worried about becoming seasick. All of the line’s small coastal ships are fully stabilized for smooth sailing and all of the line’s paddlewheelers are authentically built. American operates itineraries to Alaska; the Pacific Northwest, including the Columbia and Snake Rivers, and Puget Sound; the entire Mississippi River, including the Ohio and Cumberland Rivers; the Hudson River; New England, including Block Island, Nantucket and Martha’s Vineyard; Chesapeake Bay; and the Southeast Coast of the U.S.--Maine to Florida. Life onboard an American Cruise Lines ship is relaxed and mostly revolves around learning about the ports and destinations visited each day along the cruise’s itinerary. The friendly ambience is highlighted by the daily 5:30 pm complimentary cocktail hour, offering passengers a relaxed way to get to know each other. Dinner follows cocktails every evening in the grand dining room and is open seating. After dinner there is evening entertainment--from musical acts and comedians to movies and lectures--usually held in one of the ship’s main lounges. Each cruise is highlighted by onboard experts and historians, called Riverlorians, who give presentations on a variety of topics associated with the ports and regions. Meeting fellow passengers is an important part of the cruise, and the daily cocktail hour and open seating in the dining room encourages everyone to mix. While on board, passengers usually read, relax and watch the scenic shoreline views go by or chat with other passengers. Organized activities are minimal, but some ships have outdoor putting greens and sun decks with activity areas, and all the ships have several comfortable lounges both inside and out. There are many cozy places to stow away with a good book and relax or have fun playing a board game with fellow passengers. In river and small-ship coastal cruising (all American’s ships are fewer than 200 passengers) the port destinations are very much the focus of each cruise. With more time at the dock, passengers have an increased amount of freedom to come and go as they wish.Guided tours are scheduled for every port, and they may be as simple as a two-hour walk through town led by a local historian, a scenic bus tour around the city, or a visit to a museum or historic location. Some complimentary and others are available for an additional fee. On all American Cruise Line’s ships, the food is traditional American cuisine, with some regionally-inspired offerings added to the main menu. Classic American fare is the norm. Fresh seafood, from Maine lobsters to Maryland Crabs, is highlighted on certain Northern itineraries. Southern cooking is featured on many of the Mississippi River cruises, and Pacific Northwest-inspired cuisine can be found on some of the western trips. Breakfast always features freshly baked breads and muffins, and lunch and dinner often offer freshly baked pies made with local produce like fresh Maine blueberries in the summer season. Breakfast room service is available on many ships for guests to enjoy on their private furnished balconies. Lunch is generally a light meal with soups, salads, sandwiches and wraps also on the menu. Half portions are available on request. Beer and wine are complimentary at both lunch and dinner. The line does not sell alcohol, but in addition to the complimentary cocktail each evening, the ship does try to meet passenger special requests (and are willing to go ashore to fetch anything extra a guest might require). The chefs are happy to accommodate any special dietary restrictions or requests (especially those made in advance of sailings, giving them better time to plan and prepare). The daily cocktail hour is very well attended and eagerly anticipated. About 10 percent of men wear jackets on a given evening, but jackets are not required and the dress is mostly relaxed and country club casual. American Cruise Lines attracts an older, geographically diverse clientele from all regions of the country and Canada with a high number of repeaters on every voyage. Children are rare, although some of hte summer itineraries can draw a slightly younger crowd. American does not forbid young children, but the itinerary-based cruises and low-key small ships are much better suited to adults and older family groups—and can be especially wonderful for adult children who want to enjoy a special travel experience with their older parents. Many sail American Cruise Line because they simply dislike larger ships or want sheltered waters. For others, the initial draw is the unusual itinerary or an interest in the historical and cultural sites such as museums or homes of historic figures. The line also does a very good job catering to people with mobility issues, which makes it a popular choice for seniors. 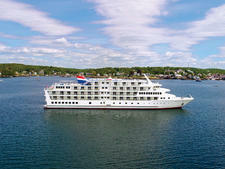 All American’s ships have elevator access to all decks and all ships have special handicap cabins available. There is also a broad range of cruising experience among the passengers, from those who are cruising for the first time to those who have sailed with the line multiple times. Many of the line’s passengers enjoy the line's focus on domestic itineraries taht are hassle free and highly educational. Most enjoy the slower, low-key pace of river and coastal cruising and enjoy the small-ship atmosphere which encourages the opportunity to meet new friends and like-minded travelers. .
American Cruise Lines has a large fleet of new small ships which are built and designed in America. The line is renowned for having the largest cabins in the industry. This in particular is one of the key attributes differentiating American Cruise Lines from most other U.S. competitors, many of which operate refurbished ships. Almost all of the cabins found aboard American’s new ships come with private furnished balconies with floor-to-ceiling sliding glass doors. In addition, most cabins have sitting areas, writing desks and full size bathrooms. On American’s ships, even the cabins without private balconies have large picture windows that open, allowing the cool night air and sounds of the sea to drift into your cabin. Cabins for singles are available without any single supplement added and handicap cabins are available for the disabled on all ships in the fleet. 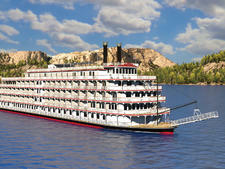 There are elevators to all decks and guests can select 2 twin beds or a king in their cabins. 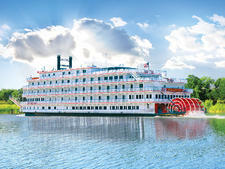 American Cruise Lines has three distinct ship styles in its fleet: small coastal cruise ships, authentic Victorian style paddlewheelers and modern-style riverboats. The décor on American’s coastal ships is comfortable, and unpretentious with pleasing neutral colors and handsome nautical touches. The décor on the line’s authentic paddlewheelers is Victorian-style, with lovely velvet sofas and rich plush tones in-keeping with the period. The modern riverboats have 4 story glass atriums, and sleek modern design while remaining practical, comfortable and true to their brand. In general, all the ships have several lounges, an exercise room, a small library, and a recreation area on the top sundeck. The ships are well designed and spacious while remaining small enough to be intimate and allow all the passengers a chance to meet each other over the course of a cruise. Most ships have two large main lounges; one at the bow and the other at the aft of the ship. Both large lounges have tall windows all the way around, providing great views of the passing scenery and are the social hubs of the ship with comfortable sofas, tables and chairs, and most are equipt with pianos and small dance floors. Across the fleet, the ships have one large grand dining room with huge glass windows offering great views from every table while dining. The dining room is large and comfortable offering open-seating. No reservations are required and the chefs will work with any special dietary requests. All American’s ships have complimentary snacks, juices, soft drinks, and coffee or tea available throughout the day and evening in the ship’s main lounges. Every ship has an upper top sundeck where passengers will find comfortable chaise lounges, small putting greens and other simple recreational spaces for games and exercise--or for just relaxing as they enjoy the scenery. American Cruise Lines' lineup includies cruises to Alaska (with access to Glacier Bay); cruises in the Pacific Northwest in Puget Sound and the San Juan Islands; and cruises on the Columbia & Snake Rivers. The line has several different itineraries along the U.S.’s Southeast coast from Maine to Florida, includin popular Chesapeake Bay cruises from Baltimore and historic south cruises from Charleston, SC or Jacksonville, FL. 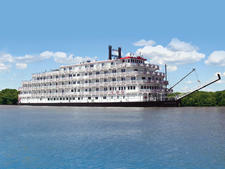 The line has many different Mississippi River itineraries on both the lower and upper Mississippi—with some cruises sailing the length of the Mississippi River through 10 states. American also runs popular New England itineraries in the summers with stops at Block Island, Nantucket and Martha’s Vineyard and Maine Coast cruises from Portland. In fall, the line offers fall foliage cruises up the Hudson River from New York City.